After seventeen years of the 9/11 Memorial Ride, eighteen if you count the spontaneous one held a few months after the terror attacks on the World Trade Centers in 2001, what keeps the motorcycle riders coming back each year is the spirit of the people who line the route and cheer them on, according to Tom Baird, from the 9/11 Memorial Coalition, the organizer of the event. 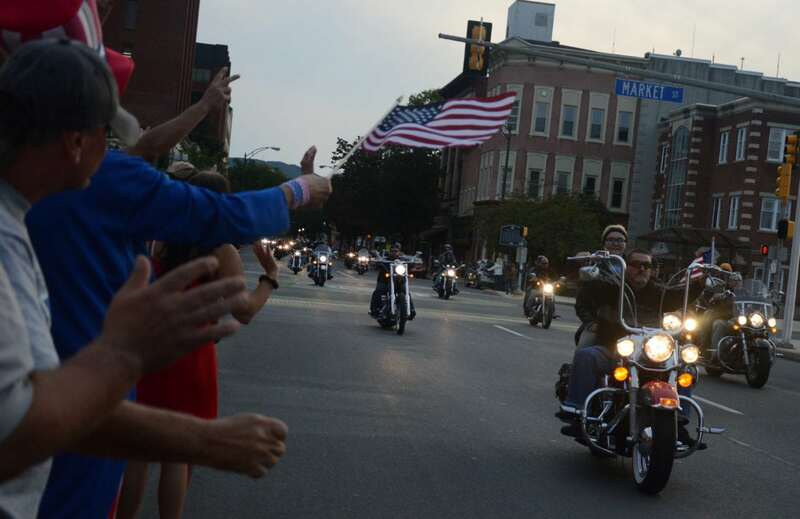 He said the riders set the stage and the public add to the event with signs, flags and their patriotism. “The ride makes a large impression on people. The loud, aggressive, American-made motorcycles make a statement that people don’t seem to forget,” he added. Baird estimated 20,000 people turn out each year to watch as the riders pass through area cities and towns, many with flags attached to their bikes. Baird is quick to point out that the focus of the ride is not just to honor the victims of the terror attack, but also the veterans who have given their lives in the War on Terror as well as the first responders. The coalition has worked to establish an EMT scholarship. This year’s memorial service prior to the ride will feature guest speaker Sara Christensen, a unit movement officer and medevac pilot with the Pennsylvania Army National Guard. Christensen reapplied to the Guard and took the oath as a warrant officer in December of 2012. She qualified on the blackhawk helicopter the next year and was deployed to Kuwait in 2015 in support of Operation Enduring Freedom and Operation Iraqi Freedom. Christensen now serves at Fort Indiantown Gap. The importance of remembering 9/11, according to Christensen, is to look back at how the country came together after the attacks and that the need to view neighbors as fellow Americans is as strong as it ever was. She and her husband, both motorcycle enthusiasts, will be riding in the motorcycle procession. The event, which is held at the Clinton Township Volunteer Fire Department, 2311 Route 54, Montgomery, begins at 10 a.m. There will be food available before and after the ride. The memorial service begins at 5:15 p.m. followed by the ride at 6 p.m.